It seems such an odd word to find in a document involving land. Okay. 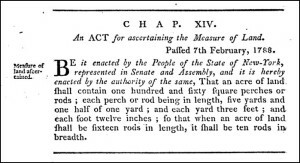 What the heck was a perch in 1788 New York? But this document is from New York, not England. It’s probably the same, but we need more. But Black wrote his dictionary in 1891 — more than a century after this New York mortgage. But “a bit earlier” is 1856 — almost 70 years after the mortgage was executed. So did the word mean the same thing in 1788 New York as it did to these dictionary writers decades later? Probably. But probably can get us into trouble. So how do we know for sure? It pays to go fishing … in the statute books of the day. I still like the image of laying fish out head to tail to head to tail all over the land, measuring. Would be good for the land, too. 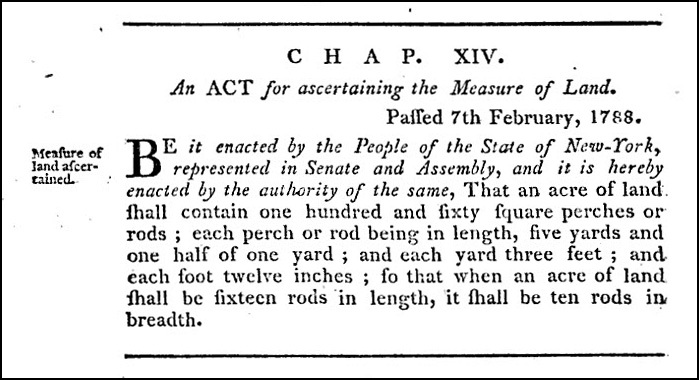 5 1/2 yards… an odd measurement, no matter how one looks at it. Thanks for a very useful post, Judy! Can you imagine the smell of using fish head to tail??? ?